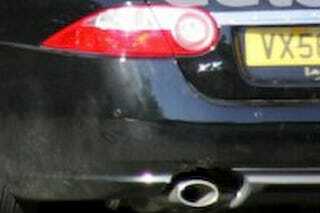 Actually, we don’t know if this is a 2010 Jaguar XK Hybrid or some other form of alternative powertrain, but Next Autos’ spy photographers were shocked to see it lapping the Nurburgring in anger this morning while making almost no sound from its dual exhausts. Click through to see what they had so say. What’s the thing with this strange Jaguar XK? The front bumper does not look like the old, and also not like the one we have seen on the face-lift prototypes. So that’s a completely new one. And also the cut out for the exhaust pipes in the rear bumper look different. Bonnet is from the XK-R One other strange think, this car was very quiet. We can normally hear all the Jag prototypes roar when out on the loose, especially on the Nürburgring track, but not this one. So that makes us wonder if this is a hybrid prototype from Jaguar.